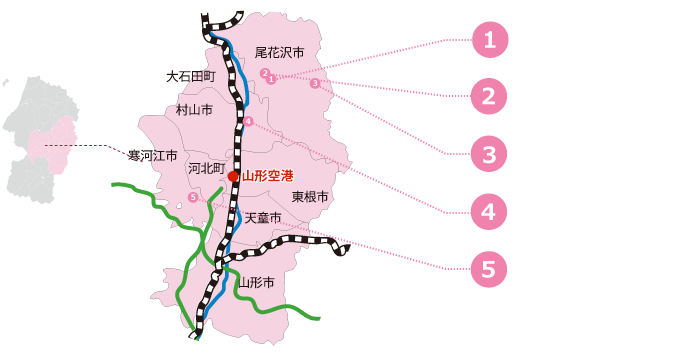 One-day plan that started from Yamagata Airport. Mainly on winter season-limited experience, we introduce new activity. With hokkorisuru experience including activity using snow itself and hot spring bathing only by winter, iaido experience to conflict with the essence of Japanese culture was enabled newly. As reservation is necessary, person who is interested look at HP by all means. Tokura-ko Lake Snow land (Obanazawa-shi), Hayashisaki Shrine iaido experience (Murayama-shi) is new experience-based sightseeing that we began in 2018. 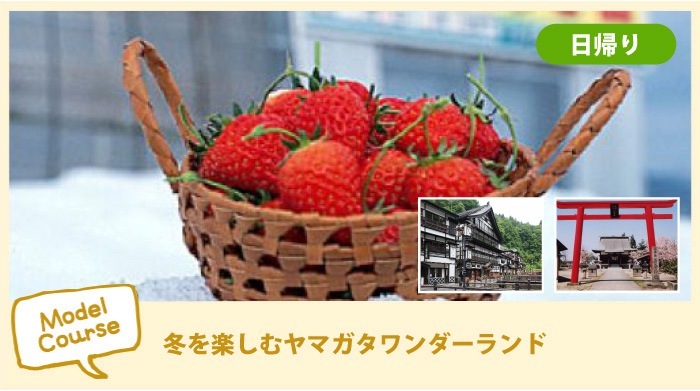 As strawberry picking during snow is experience only by the winter season, it is recommended to Yamagata that is active, and wants to enjoy winter. In iaido experience, valuable earnest test of is in particular possible with specialized leader. 16 people can experience from one at a time. Please experience by all means! Making use of snow as a source experience-based facility to open only in the winter season. We can experience various activities including snowmobile and Snow roller. We are going to open this season on Saturday, January 19, 2019. Please enjoy snow with all one's might. Please refer to HP of Obanazawa-shi, sightseeing topics. After having played in Snow Landes, let's warm in one-day hot spring. There is near the "flower shade leading" birthplace, Tokura-ko Lake, and bathing while we look at snow scene is the best. Ginzan Hot Springs that nostalgic cityscape to feel Taisho wave abusive no homesickness is famous is popular among domestic and foreign tourists. 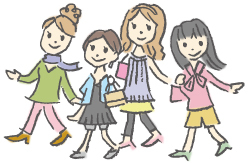 While take a walk; when eat the way, and, by shopping, trip time? Nihon Issha Hayashizaki-iai Shrine of Murayama-shi is the birthplace of iaido. Iaido experience came to be possible here from this year. Test of using genuine sword is possible, too; can have a valuable experience. In the suburbs of Sagae-shi, we can enjoy strawberry picking of plastic greenhouse cultivation in snow scene of one side. As popularity becomes higher year by year, is not in the latter half of season; ...?